The Toshiba Folio 100 comes with a large 10.1″ widescreen capacitive touchscreen that will certainly be enough for all applications. The resolution of 1024 x 600 pixels, identical to the one on Galaxy Tab, while hardly overwhelming on the larger screen is certainly sufficient. Without doubt one of the coolest features of the Toshiba Folio 100 is its NVIDIA Tegra 2 CPU. We aren’t particularly sure that so much power is necessary on a tablet that is running a phone OS, especially after seeing the Tab do 1080p playback on a 1GHz Hummingbird but maybe this is an investment that will pay off in the future. We’ve prepared a short demo video to give you a general idea about the Folio real-life performance. Of course its software is still far from being finalized so final verdicts will have to wait a bit. 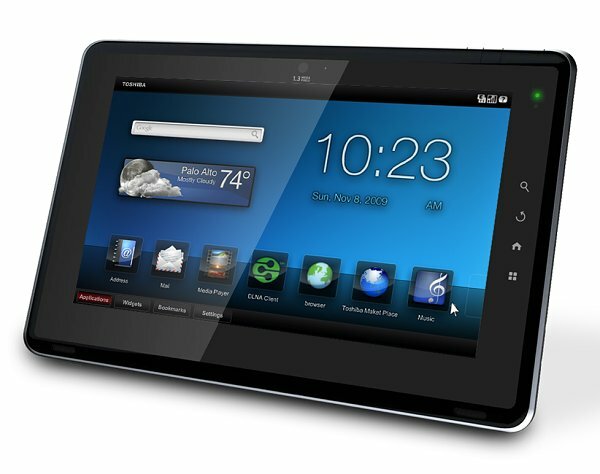 Speaking of the software, Toshiba have added a few touches to the Android 2.2 Froyo that the Folio 100 is running. We aren’t particularly impressed by them and knowing that they slow down updates makes us wonder if vanilla Android wouldn’t have been a better choice. But who knows – maybe the final version will surprise us. We will find the answer to that one in a month when the Folio 100 hits the shelves. For what we know the pricing seems good for the Flash 10.1-supporting tablet. Its main problem is that unlike the much more compact Galaxy Tab it falls in the exact same category as the iPad and that one has a significant market and popularity head start. Toshiba will have to do the performance part perfectly or forget about making an impact.